DNA is often called the 'blueprint of life' and the DNA blueprint remains in every living cell and continues to provide information about how the cell must function. It does this by controlling the proteins that are made within cells and the blueprint is passed to every new cell that forms. Junk DNA as it's popularly known is the part of our DNA which does not code for proteins and researchers believe this is where we harness our latent PSI Abilities such as Clairvoyance (Clear Vision), Telekinesis, Teleportation, Claircognizance (Prophetic Knowing), Telepathy, Clairaudience (Clear Hearing) and Clairsentience (Clear Sense). Recent discoveries in the nature of DNA have overthrown the idea that man is genetically fixed. The Human Genome Project has uncovered two interesting facts about human genes: a) man has 30,000 genes( only 300 more than a mouse) in the human DNA; b) only 10% of the human DNA is used for coding and reproduction of proteins; the rest –approximately 90%-- is known as junk DNA which scientists have considered garbled and redundant. However, the Russian Branch of the Human Genome Project , headed by renowned Dr. Pjotr Garjajev, has uncovered the linguistic and psychic capabilities of junk DNA, ushering in a re-evaluation of the human gene in terms of words, wave genetics and a grammar of spirituality. This discovery also points to the significance of sound frequencies and vibrations in the origin of human life and the possibility that creation was generated by waves of consciousness. The Phantom DNA effect is a case in point: the energy field of a DNA sample remains detectable by laser light even when the physical sample is removed. At a fundamental level, man is pure energy. In Wave Genetics, the junk DNA functions at a rich infrastructure level of super codes and wave communication, realized in material form as crystalline structures—dynamic gene-holograms in liquid crystals of the chromosome continuum. What this model suggests is that the human gene is part of larger holograms (multiverse) of wave information reality. Hyper-communication, in the form of remote sensing, remote healing and telepathy, is definitely a part of the human protocol. Is it possible that the linguistic structures of the human genome point to a form of universal speech, a grammar of spirituality? William A Tiller in Psychoenergetic Science: A Second Copernican-Scale Revolution (Walnut Creek, CA: Pavior Publishing, 2007) certainly thinks so. Man, he explains, is composed of a personality body self and a “rich infrastructure ...in subtle bodies” that lead to ”greater human performance and expanded capabilities”. The purpose of life is building this infrastructure into a grammar of spirituality. Michael Cremo in Human Devolution: a Vedic Alternative to Darwin's theory (Badger, CA: Torchlight Publishing, 2003) claims that man originated billions of years ago in waves of consciousness, but has “devolved” into an ego-driven modern counterpart , alienated from the group consciousness and spirituality of his ancestors. Group consciousness can bring about the healing of the earth. If weather can be influenced by Schumann’s frequencies, man, who is capable of resonating at these frequencies, can through group consciousness bring about changes that dissolve violence and restore earth to its natural balance. 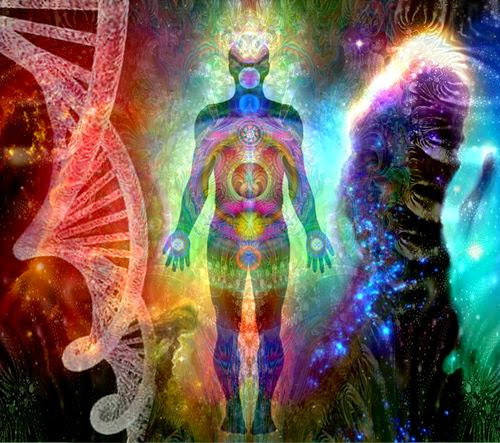 DNA activation is ultimately a matter of gradually building one's own multi-dimensional awareness and abilities through one's own efforts. It is a journey towards wholeness and higher frequency attunement that becomes a reality only when individuals have become autonomous and self-empowered. 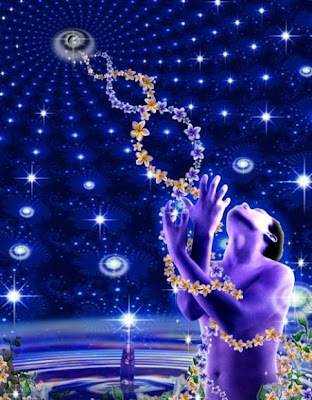 DNA activation is a function of an acummulation of positive energy or quantum energy from the unified field. If people genuinely cared about the welfare of others they would not charge thousands of dollars to learn their so-called secrets. I have researched DNA activation sites on google and most of them charge 300 - 1000 dollars for DNA activation! And I noticed a trend of how they reel you in with temptation of benefits to health and mind, and then slap a hefty price on enlightenment. A dent in your wallet and your spirit! Jesus, Buddha, Guru Nanak, Krishna etc did not ask people for the master cards before they could see the kingdom of heaven so what gives you the right, Ian? The new age movement needs to move away from charging massive amounts of money for something that can be taught for free. Teach a man how to fish..
devoted lightworkers charge nominally or nothing, as we truely care about everyone and the act of helping is itself the reward. Anonymous, Jesus and other masters lived in an era when their needs were taken care of in OTHER ways. They were given food and shelter for their work, just as light workers today should receive enough to have food and shelter. Most light workers today seem to be broke. There are of course many TYPES of abundance, but we need financial to be one of them, because true light workers will pour money back into other people in positive ways when their own needs are adequately met. Also, if no one was having good results from DNA activation as provided by someone else, I don't know that it would have carried on this long. There are often things that we can do on our own that are HASTENED by help from others. I believe accurately trained DNA activation is one of them, and many people who place their personal development above other things may wish to invest in this process. Hoping these are useful viewpoints. Do Not Pay for some guru's mindfulness, pay for the entheogens and discover yourself. If they are selling something, they are probably sell outs. No matter what is said, 2 people DO NOT and Physically CAN NOT have the same "god".. Beware modern religions or spirituality's, all have been created to put you down the same path, a path that is not YOUR OWN. Through Individuality, you can begin to recognize and respect other peoples individual god minds. The rules from almost every religion are the same, then they throw conjecture and allegory all over it that mock the rules they are based on. Search for the pre-history of popular symbols and you will come to realize that these same systems and religions were created all around the time of ancient sumer and egypt. It is also important to realize history is written by the winners, and all of the information we can get stops being studied at about that time. Create your own pineal activation tones and patterns, to find YOUR god .. not to be sold greed subconsciously.... "They do it, why cant I?" BECAUSE ITS GREEDY, Siddhartha would be ashamed.